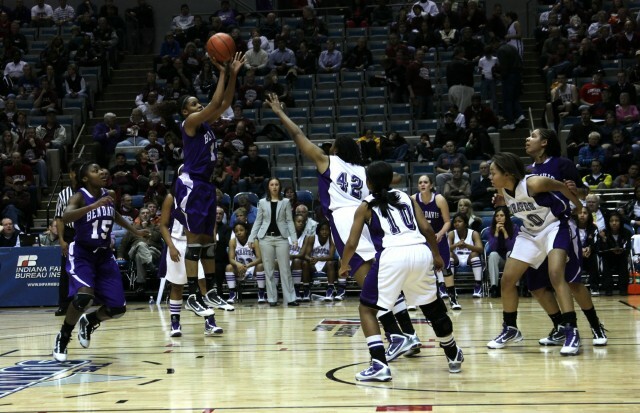 In its 26th year of honoring the nation’s best high school athletes, The Gatorade Company, in collaboration with ESPN RISE, today announced Bria Goss of Ben Davis High School as its 2010-11 Gatorade Indiana Girls Basketball Player of the Year. Goss is the third Gatorade Indiana Girls Basketball Player of the Year to be chosen from Ben Davis High School. The 5-foot-10 senior guard averaged 21.6 points, 7.1 rebounds, 3.6 steals and 3.2 assists per game this past season, leading the Giants (24-1) to the Class 4A state tournament round of 16. A 2011 McDonald’s All-American Game selection, Goss shot 53.7 percent from the floor and 81.4 percent from the free throw line for Ben Davis, which won 81 straight games and back-to-back Class 4A state titles before losing in this year’s state tournament. As a sophomore, Goss hit the game-winning shot in the 2009 state title game. She concluded her prep basketball career with 1,604 points. Goss has maintained a 3.33 GPA in the classroom. She has volunteered locally with the Fellowship of Christian Athletes, as a youth basketball coach and as part of multiple community service initiatives in association with her church youth group. Goss has signed a National Letter of Intent to play basketball on scholarship at the University of Kentucky this fall. Goss joins recent Gatorade Indiana Girls Basketball Players of the Year Courtney Moses (2009-10, Oak Hill) and Skylar Diggins (2007-08 & 2008-09, Washington) among the state’s list of former award winners.